I recently read in the May 18 issue of Entertainment Weekly that filmmaker Edgar Wright (SHAUN OF THE DEAD; SCOTT PILGRIM VS THE WORLD) “is developing an origin-story” of Ant-Man, one of the original founding members of the Avengers (p.6). Wright began his Ant Man project back around 2007. In July 2011, he delivered a third draft of the script to Marvel Studios. The EW column explained that the first incarnation of Ant-Man was “…Henry Pym, a biochemist who discovered subatomic particles that allowed him to alter his own size.” He developed a “cybernetic helmet” which gives him control over ants. You can read the detailed origin story here. According to Wikipedia, the Wasp was “Created by Stan Lee and Jack Kirby, the character first appeared in Tales to Astonish #44 (June 1963).” You can read about her origin story here. Janet Van Dyrne is also one of the founding members of the Avengers. According to EW, there are no plans to make a film based on the Wasp, nor have I seen any information to indicate she will be in the Ant-Man film. The more I researched, the more I became convinced that Ant-Man and the Wasp would make a terrific action-adventure superhero romance film. Henry and Janet have a long and tempestuous relationship history, but for the purpose of a feature film the story would only need to focus on the time they met, fell in love, overcame their personal demons, defeated the villain, and made their commitment to each other. When Janet's father died, she convinced Pym to help her. He gave her a supply of "Pym particles" and subjected her to a biochemical procedure which granted her the ability, upon shrinking, to grow wings and fire blasts of energy, which she called her "wasp's stings". As Ant-Man and The Wasp, they defeated the monster, sent it to its own dimension, and had several more adventures together. 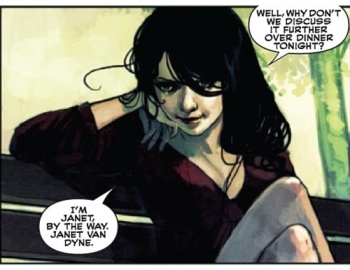 Janet became Pym's partner and fell in love with him before their first adventure, but Pym rejected her at first, afraid of what would happen if he were to lose her as he had lost his first wife, who was killed. Janet would openly muse about her apparently unrequited feelings, often in front of him. Pym rejected his feelings for her; however he later accepted them and tried acting on them. They both soon realized their feelings for each other, and began dating. That’s the film I want to see. By himself, Ant-Man is just another scientist superhero. Been there, done that. The real adventure starts when he joins with the Wasp. They fight villains and fall in love while doing so. And their superhero powers are based in science! Edgar Wright has even been “…researching nanotechnology for the film.” Sweet. So, Marvel Studios and Edgar Wright, hear me out. You still have time to change the direction of your Ant-Man film. 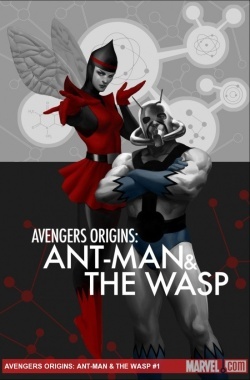 You can still do the origin story, but consider compressing that element in order to introduce the Wasp as Ant-Man’s premier partner and eventual lover. The Wasp is a strong, smart female character and she not only complements Ant-Man, she completes him. Newsflash: Not all superhero films have to be aimed at or be about the fantasies of ten year old boys. Girls and women have fantasies, too, and get this—they like stories with love *and* adventure! Think of the advantages of creating a sophisticated superhero action-adventure love story. Number one with a bullet is all of those geek girls who would go nuts over a character like the Wasp playing such a central—and equal—role. And many of them have boyfriends, girlfriends, husbands, lovers, children and friends that they’d buzz to about the film. I mean, like, wow, you’d not only be taking superhero films to a new, progressive level, you’d make money, too! Postus Scriptus: Edgar Wright is on Twitter: edgarwright. Just sayin'.